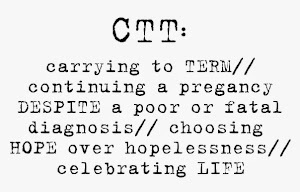 I am sure that the experience of CTT has you filled with not just questions, but fears. Here are some of the fears I had that you may have, as well. I am afraid my baby is suffering and that prolonging his life is cruel. -There's often no way to know for certain if your baby is in pain. There is evidence that babies do have the capacity to feel pain even in the womb, but to what extent, is unknown. Personally, I was often worried that Gabriel was in pain or distress. As Gabriel's parents, it was up to us to make the choice that we thought was best for him in the long run. If he had even the slightest chance to survive, we had to allow him to keep fighting. It's what I would want someone to do for me, if I was sick. I would want someone to fight for my life, even if it meant I had to suffer temporarily. We agreed that Gabriel deserved the chance to live, and that the risk of potentially ending a life that otherwise could have been saved was greater than the risk of him suffering for a few weeks. I am afraid to hold a dead baby. -To most people, the thought of holding a dead baby is a little scary. 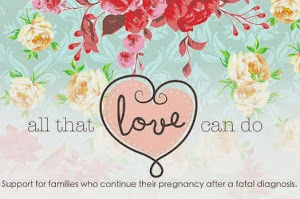 When I was pregnant the thought of holding my son if he was stillborn or having to watch him die in my arms often brought me to tears. I couldn't fathom what it would be like. I had this awful image of what a dead baby would look like. But now, I know that this fear I had was crazy. The second that Gabriel was born, I couldn't wait to hold him. It felt like hours passed by as the nurses rushed to clean him up and bring him to me. I didn't care what he looked like... I just wanted to see him and hold him close. When I saw his face, he just looked like he was sleeping. He was warm and soft, not the least bit scary. I knew his soul was gone, that the tiny body I was holding tight and cradling carefully was just a shell - something that represented my son - something he was no longer a part of, but I loved touching his skin and taking in all his beautiful features. I can't say for sure exactly how you're going to feel, but I do know that you won't find your baby scary or daunting and that you are much more likely to regret not holding your baby. I am afraid my baby will have physical deformities. -Depending on your baby's condition, she may have noticeable physical deformities. However, I can assure you that you will see only the beauty. All babies, no matter what they look like are so precious and sweet, but I personally believe that angel babies are graced with extra beauty. Gabriel had a few obvious physical flaws. He had a stretched out abdomen and a lot of fluid in his tummy. He had crooked legs and a crooked back caused by being constricted in utero. He had puffy eyes and bruises all over his body from the delivery. And yet, when the nurse first handed him to me, I honestly thought to myself, He's perfect! Still today, I think he is the most beautiful baby I have ever seen. I am afraid of bonding with my baby and then having to say goodbye. -I have to admit that this was one of my greatest fears. That I would fall in love and form a bond with someone, then immediately have to let him go. But after I held Gabriel, I knew I had made the right choice. And even though I did bond with him and even though it felt impossible to let him go, I was so grateful to have had the chance to meet him and hold him. In the end, loving Gabriel was the best thing that has happened to me. I will always carry the pain of loss with me, but there is no pain in the love, only joy. I am afraid of making the wrong decisions. -If your baby is born alive, you will have to make decisions as to the care of your baby. You can consult with your neonatologist in advance to go over all of your options. This may help to ease your worries. It may also help you to do some research or talk to others who have been in similar situations to see what choices they made. In the end, only you can decide what is the best course of action for your child. Trust your instincts, use your judgment and follow the advice of your doctor only if it feels right to you. Our plan was to have the neonatologist examine Gabriel to determine the level of lung development. If the doctor confirmed with certainty that Gabriel's lungs had indeed not developed, we were planning to have pain medication administered and then allow him to pass peacefully in our arms. If the doctor thought that Gabriel's life could be saved by any means other than extreme life support, we were going to have the doctors take him to the NICU to care for him. All of our decisions were focused on what we thought was best for Gabriel, not for us. And we knew we could be at peace with any choice we made as long as we had Gabriel's best interest at heart.